Sometime before the first surviving written historical account, Rome was controlled by the Etruscans, a brutal civilization from the northern part of the Italian peninsula. Etruscan kings rained terror for more than a century until the Romans rebelled and expelled their ruler in 509BCE. The early Romans were miserable living under a king, so they created a republic, a form of government in which elected officials share power. In place of a king, the Romans elected two consuls with equal power. The consuls served for only one year and could not be reelected. The consuls held veto power over one another. Veto means “I forbid" in Latin, the language of the Romans. Neither consul could make a law without the consent of the other. The Romans never wanted power concentrated in one person again. The Roman Senate advised the consuls. Senate is derived from a word meaning elder because many Romans considered the senators to be the oldest and wisest of their people. The consuls and senators came from the patrician “order" – mostly wealthy landowning families believed to have descended from the leaders of the rebellion against the Etruscans. The plebeians were the merchants, farmers, and craft workers of Rome. The patricians excluded the plebeians from the consulship and the Senate, so when the Senate declared war in 491BCE, the plebeians refused to fight. A legend says the plebeians withdrew from the city until they were given the right to elect their own leaders. Historians later called this the Struggle of the Orders. The patricians and the plebeians negotiated a settlement that allowed the plebeians a voice in Roman government. The plebeians elected tribunes, who represented their order against any mistreatment by the consuls or the Senate. Tribunes could veto a law passed by the Senate or the consuls. The Roman word for a chamber or a meeting room is camera. The Roman government was bicameral because both the patricians and the plebeians had representatives in the Roman Republic. The Struggle of the Orders ended in 287BCE when laws passed by the tribunes were binding for all Romans. foundation of law in the Roman Republic. 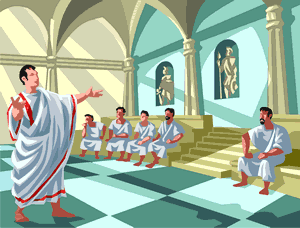 The patricians and the plebeians agreed on the Law of Twelve Tables in 449BCE. The Twelve Tables were a legal code that everyone could see. Citizens could no longer be changed in secret, and even elected officials were required to follow the law, though an official could not be charged with a crime until after he left office. The patricians and the plebeians shared power in Rome, but a third order had no voice in how they were ruled. They were the slaves. Many people captured in war became slaves. Some were former criminals. Still others–very poor Romans –sold themselves and their families into slavery to keep from starving. Roman law considered slaves to be property, so slaves had no legal rights. As many as one-third of the Roman people were slaves. 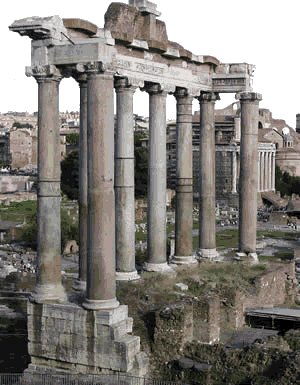 The Senate met in the Forum, a marketplace in the valley among the hills that surround Rome. The meetings usually took place outdoors and ended at sunset, so a senator could stop a law from passing by talking continuously until sunset. In times of great emergency, the Romans would select a dictator to rule the Republic. The dictator had complete control over Rome, but the dictator could serve for only six months. The Romans were at war in 458BCE when the Senate asked Cincinnatus to lead them as a dictator. Cincinnatus organized the Romans and ended the war in just sixteen days. He could have stayed in power for the remainder of his term and used the office to enrich himself, but Cincinnatus returned power to the Senate and went back to his farm. The Roman republic never officially ended. Powerful leaders such as Julius Caesar and Caesar Augustus began to take authority from senators and tribunes in the first century BCE. The Romans returned power to one person after five hundred years as a republic. More than two thousand years after the Romans formed their republic, a group of colonists in America rebelled against the English king and formed the United States of America. The founders of the new American nation wrote a Constitution that looked to ancient Rome for as the model for their new government. Like the Roman model, the American government is bicameral. Each of the fifty states elects two Senators to represent them in Congress. The United States Constitution allots seats in the House of Representatives based on the population of each state. Each state has at least one of the 435 seats in the House of Representatives. The framers of the American Constitution borrowed the Roman idea of sharing power among many groups. The president can veto a law made by Congress, but under the American system, a vote of two-thirds of each house of Congress can override the president’s veto. Every elected official must follow the law. Even the president can be removed from office by Congress for what the Constitution describes as “high crimes and misdemeanors." 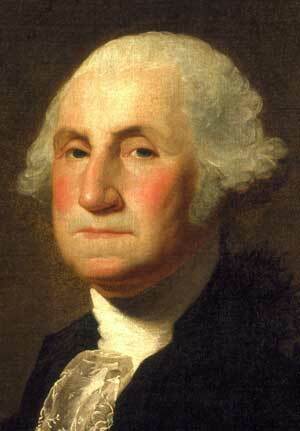 George Washington (1732 – 1799) served as the first President of the United States from 1789 to 1797. Historians often compare George Washington to Cincinnatus; America’s first president demonstrated his belief in turning power back to the people instead of keeping if for himself. At the end of the American Revolution in 1783, Washington was the commander of an army that might have marched to Philadelphia and taken control of the government. Instead, Washington resigned his post and returned to his home in Mt. Vernon, Virginia. Washington was twice the unanimous choice of the Electoral College to serve as President. He declined a third term and again returned to his home.